Residual Effects (ie. 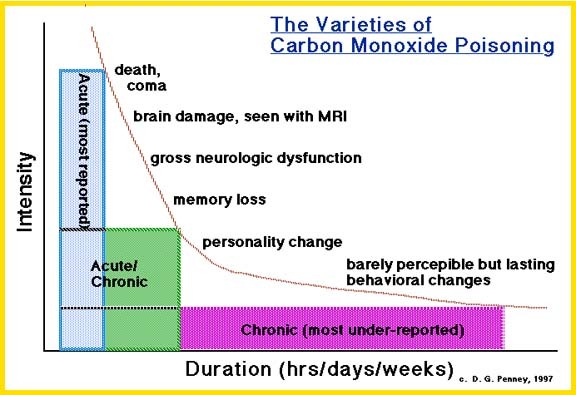 longterm damage) of CO Poisoning. - CO poisoning comes in many varieties. It can be acute, occurring over minutes to a few hours. It can consist of repeated acute poisonings over brief periods. It can occur over many days, weeks, months and involve relatively steady air CO concentrations or variations over time with the possibility of single or repeated high CO levels separated by brief or long durations of low CO concentration. The effects are often more obvious with brief severe poisoning, but sometimes no less debilitating with longer lower level poisoning. Recent studies suggest that lower-level (even levels previously thought to be "low" or "very low"), longterm exposure to CO can produce serious and persistent health harm to a large fraction of the population.